IMO, pointless to prime members if you're forced to pay returns &amp; taxes!.. Does anyone know what power lead this will come with? Please clue me up on these deals?.. How are we UK citizens able to get anything from Amazon other than the UK site?.. I thought each site is for only the country the items are sold for?.. If you play rocket league it's definitely worth having a 144hz screen with g-sync (or equivalent). You need that rate for fast games. You'd never ever get the same fluid experience on a TV. Va no good for movies? Still wonder why you have chosen this monitor over bigger TV if you sit 8 ft away. No point of 144hz if you don't play fps, even if you do from this distance you will loose all the benefits. Even 30h screen would be enough. 1080p looks fine at this size if you play at a reasonable distance. 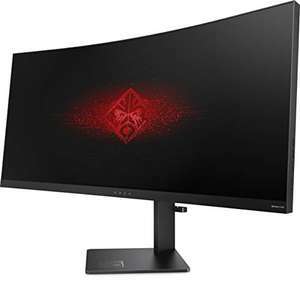 I have this monitor and sit 8ft away, I wouldn't buy a monitor of this size to sit at a desk regardless of the resolution. It's the light bleed and colours that are bad. I came close to sending it back, but I'm glad I stuck with it. I paid £350, there were very few alternatives at this price point. The benefits outweighed the negatives for me, Rocket League on this monitor is fantastic. If you mainly play more cinematic games with dark environments and will be watching movies, then you may want to look elsewhere. Decent enough i suppose. 1080p on a 31.5” screen though? Might not look so good. Seems a good deal for what you get. 3 year warranty included. Was that for a laptop though? Or a desktop? Anyone have any idea what Hz the screen is? You could, but the picture would not look great. 1440p does not scale well on a 4K monitor. That's a 1440p panel, there are no other 4k high refresh rate options at this price. Sure if you are after a 1440p 144hz panel there are a quite a few options now and the one you linked seems quite decent. 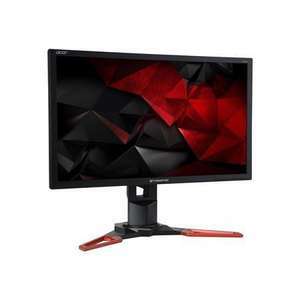 Never miss a 'G-Sync Monitor' deal again! Nice post, missed it !! 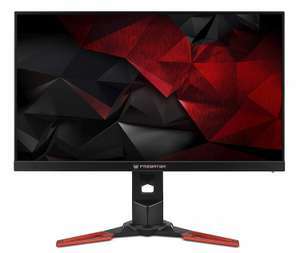 And its gone up again in price.. Acer Predator Z321Qbmiphzx 31.5 Inch FHD Curved 1800R Gaming Monitor, Black (VA Panel, G-Sync, 144 Hz, 4 ms, DP, HDMI, USB Hub, Height Adjustable Stand) RRP: £749.99 Price: £519.99 FREE delivery. This is advertising of a product; in what sense is it a deal? It was £350 last Summer. Amazon bumping up their own merch? Na I voted hot— but lots of others disagree with me;) lol. Like our little banter. You Think the offer: “Buy £715 monitor and get a mouse mat free worth £1 5” sounds temping? Around the time I bought mine, all the 240hz monitors including xb252q used the same panel so were practically identical apart from each brands strobing method. Acer has overdrive which isnt as well tuned as the benq stuff when it comes to colour distortion at the extreme settings. Regardless since its nvidia it has ulmb support. I mean, you can't just link every monitor post and then claim they're all better. You are venting, currently. Try be more constructive. Personally, I don't think it's much of an upgrade. I'd say wait for prices of 4k high refresh rate monitors to come down. They'll be a significant upgrade and very noticeable. I have this monitor. The resolution is fine if you're sitting 7 feet away. Which, to me, is the point of a larger monitor. I wouldn't want 32in if I was sat at a desk. Nor would I want anything smaller at this distance. What I didn't like is the light bleed/glow. It's particularly bad for movies, especially in the dark. Though I have got used to it. I paid £350 last year, after cashback, direct from Acer. Overall very happy with it, I mostly play Rocket League. For that purpose the pros outweigh the cons. Far too big for 1080p IMO, 1440p is the sweet spot at 27" - 32"
Wouldn't this be a bit stretched out at 1080p? Otherwise it looks pretty good to me. Fast refresh, relatively low lag, AND G-sync? Absolute bargain for the quality of this panel. Fair point, good job Amazon has the a to z guarantee in this case. £599.40 on Amazon from a merchant at the moment, 5 in stock. HUKD wont let me post the deal. Been this price for a couple of weeks. Worth noting that 4k is more demanding, personally I'd recommend 1440p or 1080p for budget PCs and get higher performance for gaming. Particularly if you're even considering using raytracing. That's just a suggestion though. Not really. 1440p is ideal for people around the GTX 1070 range. You might pull slightly lower FPS on brand new games though so might have to turn shadows and lighting down. Since posting this deal I've decided not to bite at this price, despite it being the lowest it's been in months. I'll wait until it drops below 600 I think. Is this overkill for someone with a MSI GTX 1070? looking to upgrade but not sure if the gpu would be wasted with this..
How's that then? 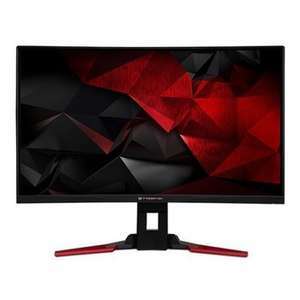 Everyone knows that 1440p 144hz is the sweet spot for gaming so it would make sense that monitors of this build quality would be this expensive, especially as an IPS Panel with low response times. If you want the best you have to pay for it. Much like Ferrari's are massively overpriced as they essentially do the same as a Ford Fiesta but it doesn't stop people from buying them, because they want the best. Massively overpriced tech imo, they're just cashing in on "Gamers" gullibility. A lot of monitor for the money. Price includes delivery. Where are you getting that from? It;s certianly not listed as one that is supported. And a cursory google search didn't throw up anything. Yeah this looks like a hacked seller account... I've been seeing an increasing amount of hacked sellers selling monitors. Had a few orders cancelled in the past two weeks when the prices seemed too good to be true. BenQ is generally more budget, typically worse panels and worse QC, unless something has changed of course. I've owned this monitor and even compared to my ultrasharps it looks great. Dell QC is great too. Haven't researched it enough to feel confident to post it. Worried that this might be part of the Asus gaming laptops that had issues with thermals.